Lethal is the book that Everyone’s Reading in the metro area this year. The annual “Everyone’s Reading” program, which is sponsored by the Detroit public libraries in Oakland and Wayne counties, have chosen author Sandra Brown’s novel Lethal as their 2012 selection. Now in its eleventh year, the Everyone’s Reading program was established to enhance the reading experience by sharing a single title throughout the community. Participating libraries are set to offer book events such as group discussions, appearances by Sandra Brown, and related topic presentations to facilitate dialogue. Anyone can get involved in the program by participating in the various events listed by both date and library location on the Everyone’s Reading homepage. The Baldwin Public Library in Birmingham will be shelving extra copies of Lethal, stocking reader’s guides, and facilitating two librarian-led book group discussions that are open to everyone. This year’s Everyone’s Reading program runs through March 22, 2012. Due to high demand, free tickets for Ms. Brown’s speaking appearances will be distributed by Baldwin Public Library through lottery for residents of Birmingham, Beverly Hills, Bingham Farms and Bloomfield Hillls. For more information call 248-647-1700. There’s good reason why Traverse City was recently ranked as a top city for book lovers. Not only does this lakeshore city hum a little literary tune all its own, but it also falls in line with a mighty band of independent booksellers strung in solidarity along Michigan’s stunning northern shores. These indies, each offering their respective knowledge and charms, compliment rather than compete through their pure, unmitigated passion for the literary arts. Such cumulative verve for the book is palpable, and has many readers road-tripping North for more than cherry pie. One of the key draws of the much-talked-about Traverse City lit scene, however, is undoubtedly the National Writers Series. “Some observers believe that Traverse City’s growing reputation as a city of book lovers can also be attributed to the National Writers Series,” asserts Publisher’s Weekly in Traverse City is for Book Lovers. Brainchild of TC native and author Doug Stanton, the National Writers Series was founded in 2009 and continues to flourish with each new season. The NWS brings at least one celebrity author each month to Traverse City for a reading and discussion of their work. 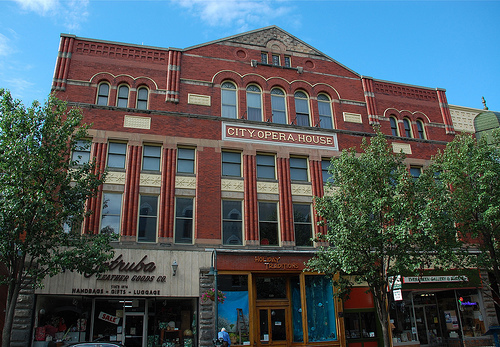 The ticketed event is usually held in TC’s 19th-century opera house. This year’s lineup includes authors Jodi Picoult, Anna Quindlen, and Geraldine Brooks among others. Also, the incredibly popular Harvard professor Michael Sandel will appear to discuss What Money Can’t Buy: The Moral Limits of Markets. For book lovers like myself who live in the Detroit metro area, Traverse City can feel like a world away. However, with the flavorful Writers Series and an incredible string of informed independents both in and outside the city, I can assure you that the drive Up North is definitely a trip worth taking. Author Megan ShafferPosted on February 9, 2012 Categories UncategorizedLeave a comment on Got Books?